Finding a proper writing workplace, proper goals, and, most important, a proper attitude can be a challenge. Some people can write in the midst of a bustling family life. Some people eke out fifteen minutes throughout the day to write while stuck in traffic or while the baby naps—whenever they find the time. Some people have the drive necessary to keep going, no matter the obstacles. I need a place of solitude in which I can hear my own thoughts. A place I can organize my days, weeks, and months. I’ve decided home is not the best place for me to do these things. There’s a place only five minutes from my home where I am free from all distractions, including the internet. I have a table where I can spread out all my material. I have electricity and a roof over my head. Everything I need. Writers don’t need much to write. Sometimes I wish we did. Like an artist with his array of brushes, canvases, and other supplies. I like the idea of having a case to open, sort of like a treasure chest. And from it withdraw the tools needed to create. All we need nowadays is a computer and our fingers. Of course, we can gather up materials if we want to create a story board or a collage. But actually our needs are simple. Needing only a laptop gives us the freedom to seek out the new places. Day One--I managed to write seven hundred words in an hour and a half. I did have to do a little research—looked up some scriptures in the Bible. I plan to work for six hours. I think it’s possible I could write five hundred words an hour; three thousand words a day. That would be sixty thousand words a month. Possible and I have accomplished that during National Novel Writing Month. But I think I will set a goal of two thousand words a day; ten thousand words a week; forty thousand words a month. I like to accomplish my goals and I don’t want to set myself up for failure. Day Two I spent working out kinks in Microsoft Word 2007. I still managed to get quite a bit accomplished—much more than I would have at home. What changes have you made in your routine? How have the changes helped you? 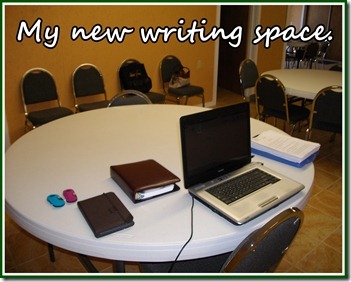 Have you found a quiet place to write, free from distractions? I posted this on "Eternal Springs" (http://sheilaodomhollinghead.wordpress.com) Reposting here.